Many years ago some bright spark at Hawksmoor suggested they should charge minimal corkage on a Monday. 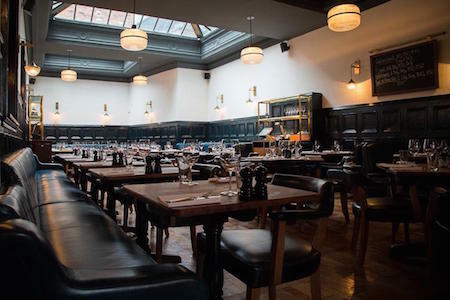 Hawksmoor Manchester, 184-186 Deansgate, Manchester, M3 3WB. Bring your own bottle of wine and only pay the £5 corkage. Bankers turned up with magnums (“it’s still only one bottle!”), students turning up with ropey bottles of Zinfandel from the local offie, and big parties turning up with a case of wine between them. They thought they were gaming the system, but there is no system. They’ve always wanted Hawksmoor to be the kind of place where people have a good time as much as a good meal. Sometimes in a restaurant you feel the food is there to be appreciated on its own, whereas we’ve always loved eating great food with friends in a beautiful room with wine. Whatever people want to bring in, that’s fine with us. You don’t need to pass a tricky initiation test to join the Monday Wine Club, just come armed with a bottle (or more) of great wine that has been gathering dust in your cellar or something cheap and cheerful from the local cash & carry and you’re in. For maximum value bring a Nebuchadnezzar of Nebbiolo and a Balthazar of Burgundy – there will be just £5 corkage on each. If you’re wondering where to pick something up from, their favourite place since they’ve arrived in town have been Saut Wines on Cooper Street, who have always been willing to offer advice on a nice bottle (and 10% off all wines for anyone with a Hawksmoor booking confirmation).